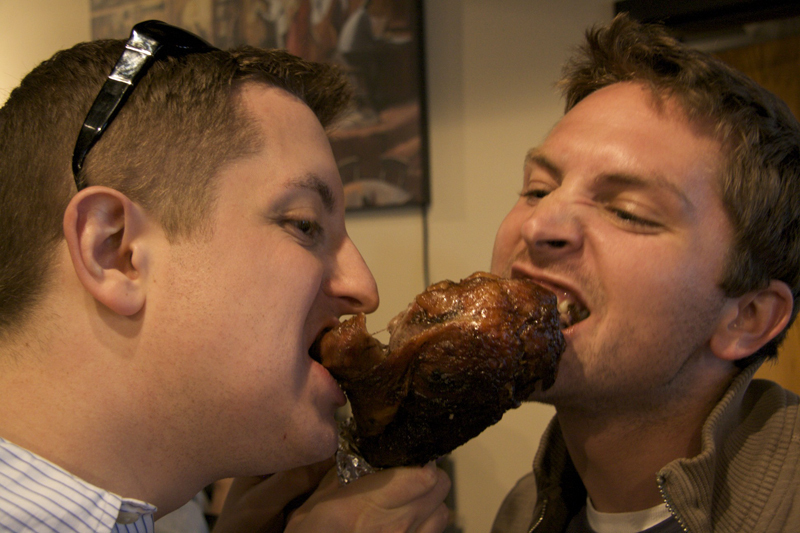 In episode 151 of the Hop Cast Ken Hunnemeder and Brad Chmielewski are joined by Brad Stark . The three of them crack open two beers that were sitting in the cellar for a while. 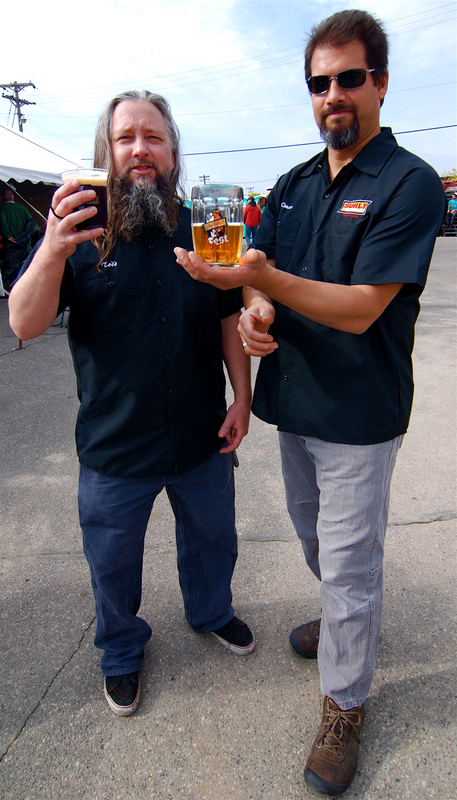 Both beers are from Flossmoor Station and were brewed by former head brewer Bryan Shimkos. Bryan is currently brewing at Half Acre and we personally look forward to seeing what he brings to the team there. While Bryan was at Flossmoor he brewed some fantastic limited edition beers. These are two of them. 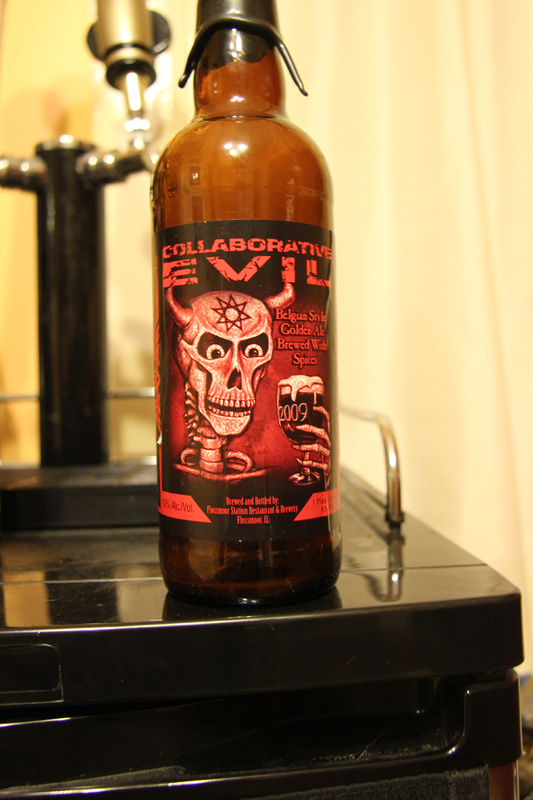 The first beer they open is the Collaborative Evil. The Collaborative Evil is a very interesting project. 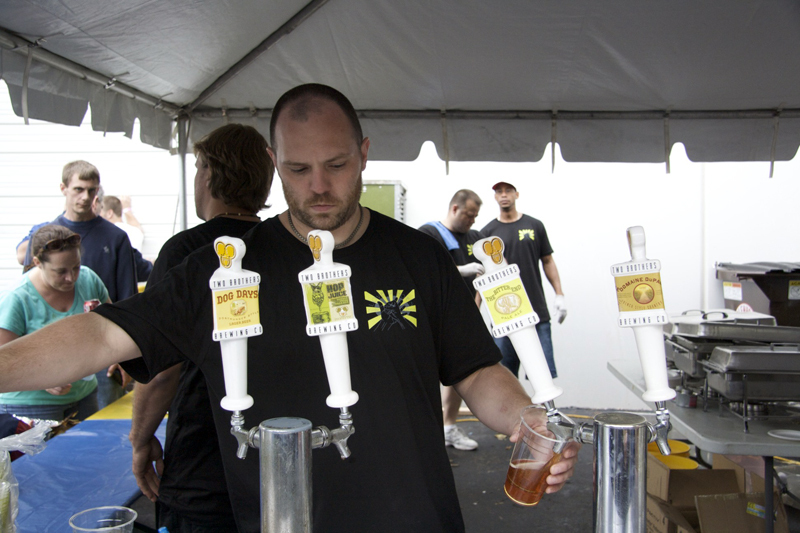 In 2008, three brewers decided to create a beer recipe and then brew it at their respective brewhouses. 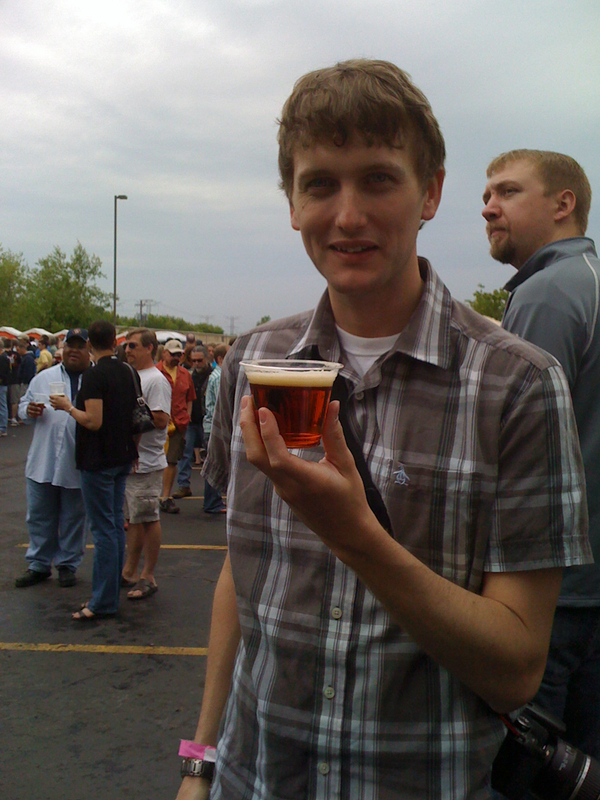 Then in 2009, six more breweries and brewers were brought in including Bryan from Flossmoor Station. The base style for this year is a Belgian-inspired Strong Pale. 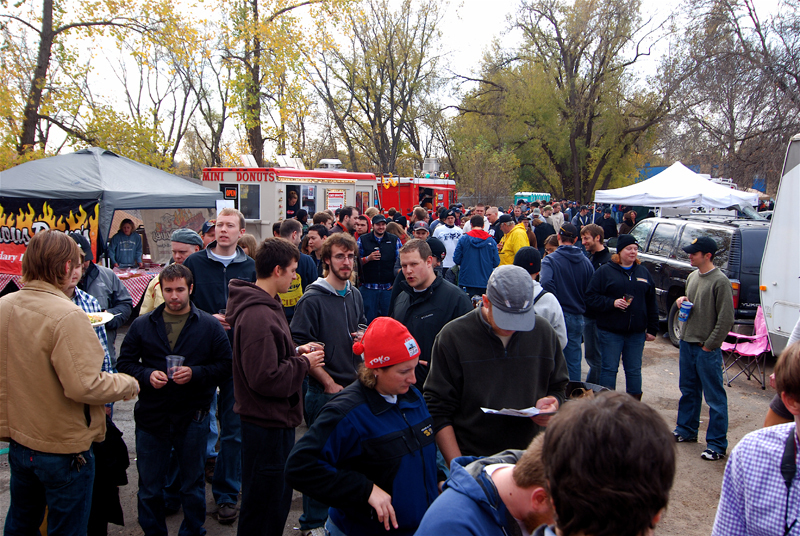 It was intended to get all the beers to the Great American Beer Festival in Denver so that they could be served at the same time under one roof. 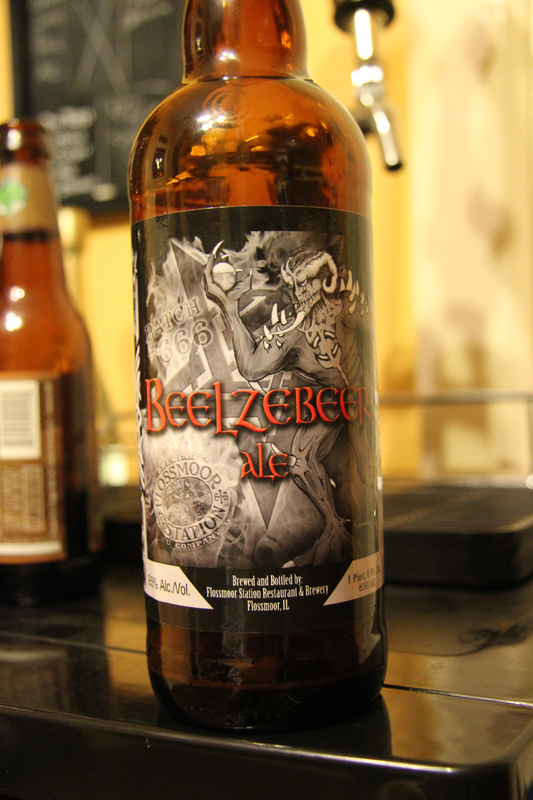 After tasting this deadly collaboration ale the three of them move on to the 11 % American Strong Ale called Beelzebeer Batch #666. With Halloween right around the corner it seemed like the perfect time to pull these devilish brews from the cellar. Having issues watching this video? Try the Quicktime (295.5MB). Episode 126 takes place in the beer nook at the cabin the Hop Cast guys were staying at in Wisconsin. Ken Hunnemeder and Brad Chmielewski are joined by Brad Stark in this episode of Bourbon barrel ales. Unfortunately there were some slight audio issues with this episode. We apologize in advance for this. 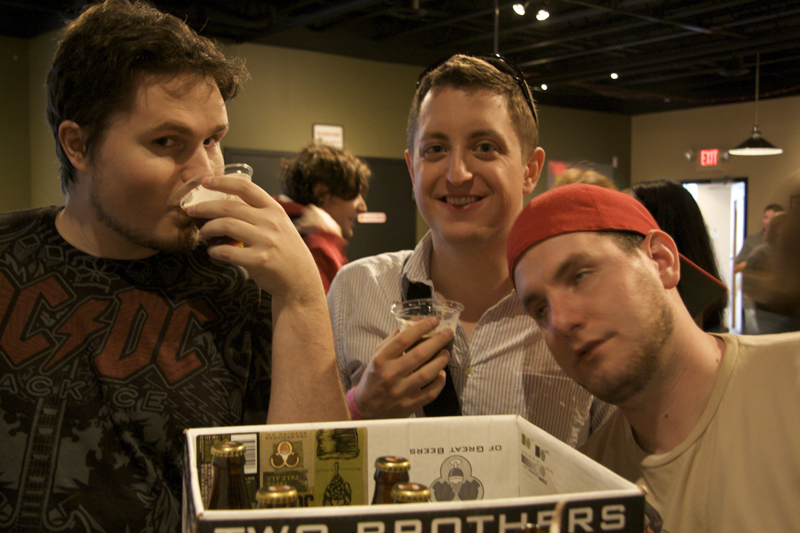 But even with the audio issues the three of them sip on some great beers. First up was one Brad picked up while he was in Portland, Oregon. It’s the Bourbon Barrel Aged Big Bang Red from New Lompoc. 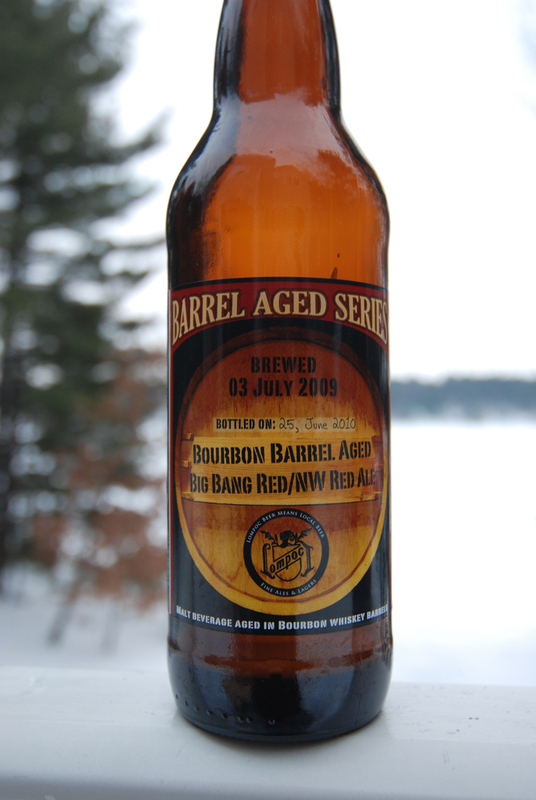 This beer was brewed in June of 2009 and sat in the barrels for just about a year before it was bottled. With an 8.20% this beer packs a ton of flavor and makes for a perfect sipping beer. 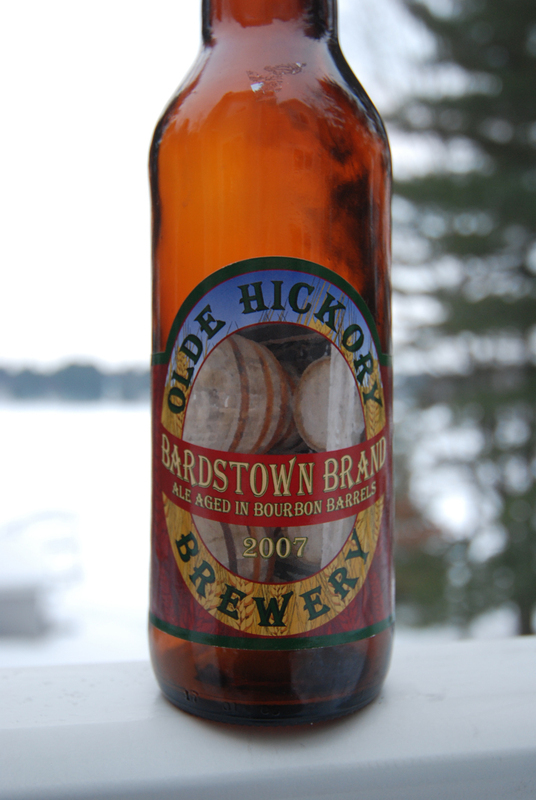 They then follow up the Bourbon Barrel Aged Big Bang Red with a 2007 Olde Hickory Bardstown Brand Ale Aged In Bourbon Barrels. This beer came special delivered from Brusin’ Ales. With an ABV of 10% this barleywine packs a huge punch. A true sipping beer that tastes like you are drinking a fine bourbon. Again we are sorry about the audio issue and thank you for watching the Hop Cast. Having issues watching this video? Try the Quicktime (222.1 MB). 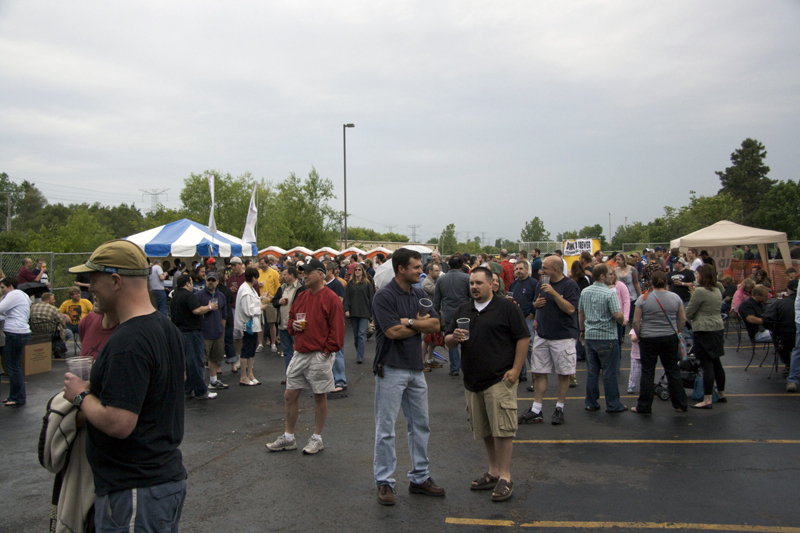 In episode 116 of the Hop Cast, we hit the road and head up to Brooklyn Center, Minnesota for Surly Darkness Day 2010. Just like Brad did last year for Darkness Day, the crew packed up the car and drove over night from Chicago to Minnesota. 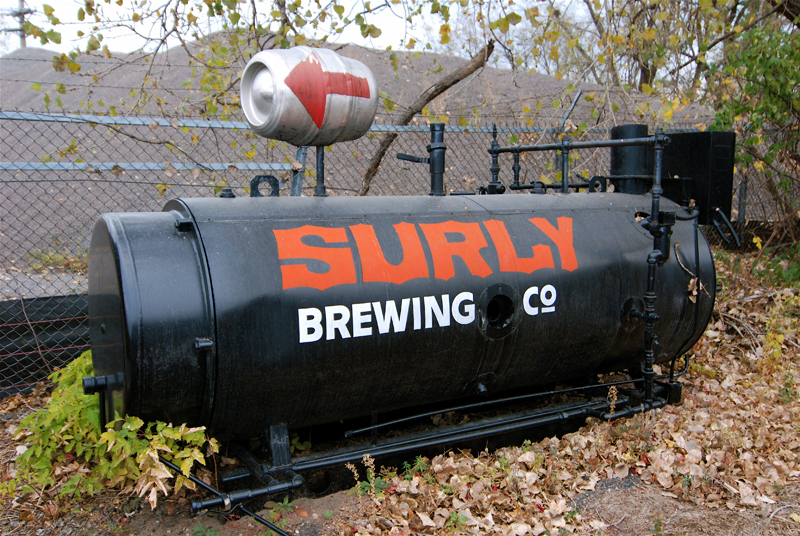 The Hop Cast crew arrived at Surly Brewery around 5:00 am and quickly grabbed a spot in the line. If you watched episode 62 from last years Darkness Day you know how this works. You are able to purchase six bottles of delicious russian imperial stout when bottles go on sale at noon. While waiting in line for seven hours Brad and Ken walked around with a bottle of 2008 Darkness to share with some friends. 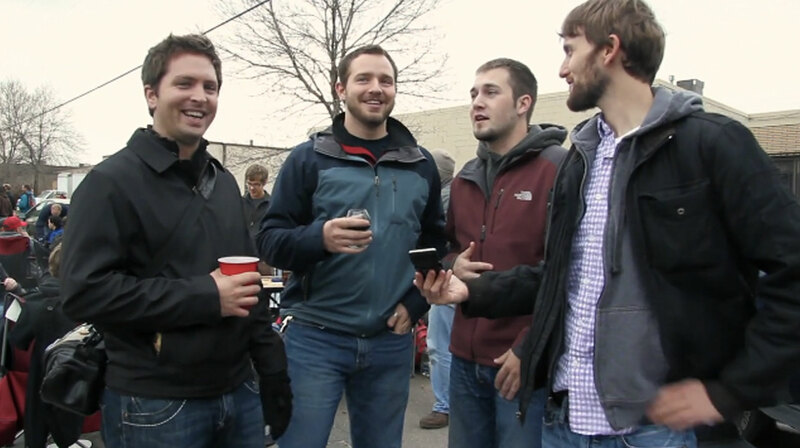 They ran into Anthony Stagno, Shawn Horton and Mike VanDelinder from Beer Genome Project and Stephen Johnson from New Brew Thursday. 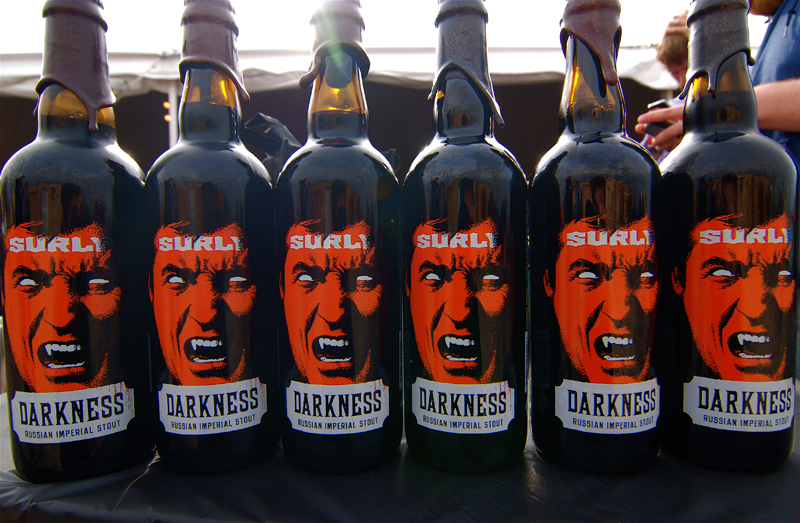 We also were able to grab a quick chat with the owner of Surly Brewing, Omar Ansari before the gates opened and the crowd rushed in to grab their bottles of Darkness. If you are in the area or willing to drive a few hours, then this a great event to come out to, it’s a bit more calm then Dark Lord and everyone always has a good time. Having issues watching this video? Try the Quicktime (259.5 MB). Brad Stark joins Brad Chmielewski and Ken Hunnemeder for episode 56 of the Hop Cast. The first beer the three of them review and sample is one straight out of Ken’s keg. It is the Stone Soup from New Glarus Brewing. New Glarus is a classic midwest brewery that is rather difficult to find out of the state of Wisconsin. The Stone Soup is a Belgian Pale Ale and has an ABV of 5.3%. 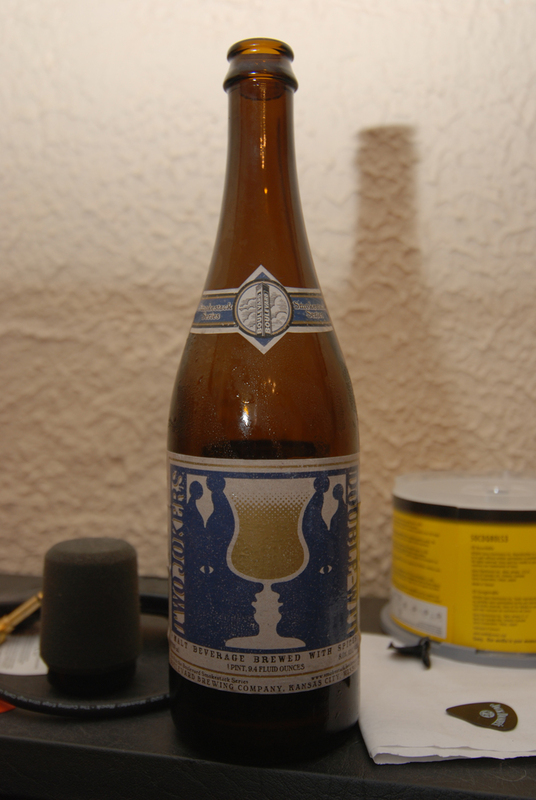 After that delicious midwest beer the three of them move onto the Two Jokers Double-Wit from Boulevard Brewing. The Double Joker was a trade to Ken from Dale Miskimins and was well worth the trade. Brad and Ken really haven’t experienced too many double Witbier’s but this beer made them want to try some more. The Two Jokers has an ABV of 8.0% and overall just plain rocked! Brad and Ken previously had a couple Boulevard Brewing beers on another episode and those also didn’t disappoint. If you can find any of Boulevard’s beers in your area, we highly recommend giving them a try. Download the Podcast (260.6 MB). 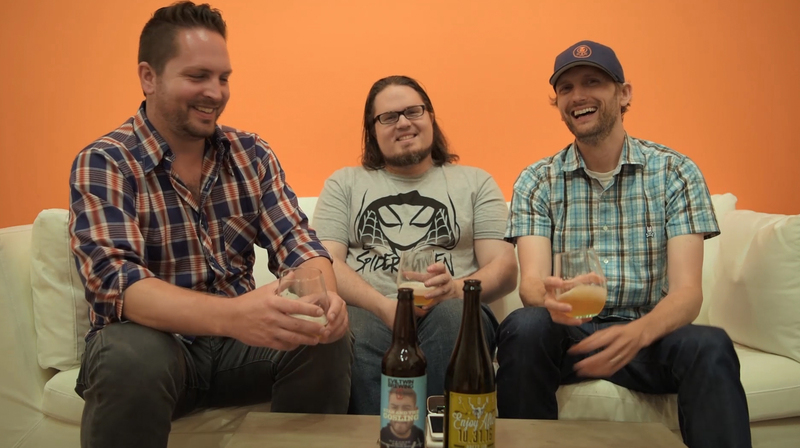 For episode 55 of the Hop Cast, Ken Hunnemeder and Brad Chmielewski are joined by Brad Stark. Brad Stark was kind enough to bring a couple beers from his recent beercation to share with Ken and Brad. It’s wonderful when people come on the show to share great craft beer they have discovered. 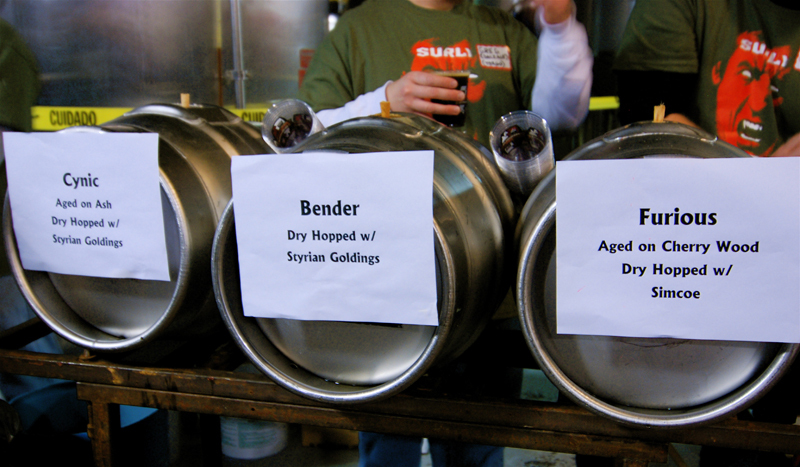 Both of the beers Brad Stark brought on are from the brewery Middle Ages out in Syracuse, New York. 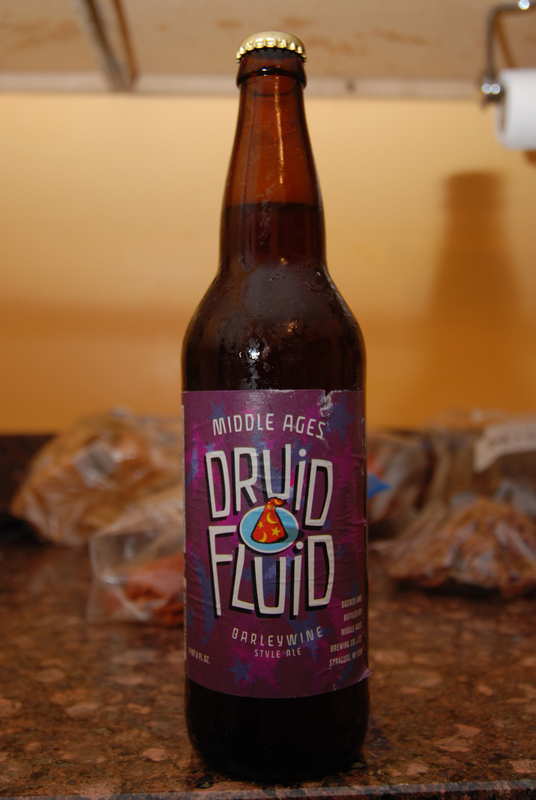 The first beer they sample and review is the Druid Fluid. The Druid Fluid is a barleywine coming in at 9.5%. After this heavey hitter they move onto the Dragonslayer. 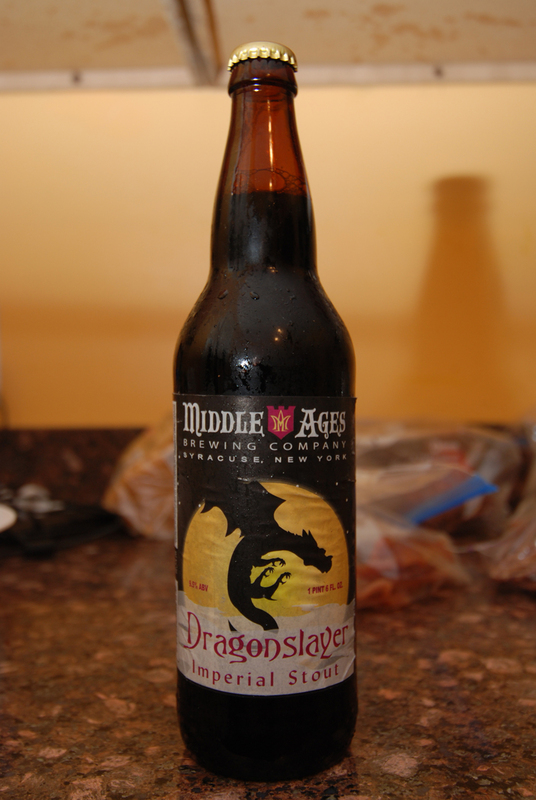 The Dragonslayer is a another high alcohol beer, this russian imperial stout also comes in at 9.5 % ABV. The Hop Cast would like to thank Brad Stark for sharing a couple great beers with them from a brewery they hadn’t heard of before. If you are in the Syracuse, New York area be sure to check out what Middle Ages is doing, they have been rocking it for over 14 years. Download the Podcast (246.2 MB). Being a Two Brothers Brewing fan and a lover of the Hops, I was really excited to go to the For The Love Of The Hops festival. Before going I somehow built up the festival in my head. I think it was due to the fact that Two Brothers was posting facebook and twitter updates for weeks before the thing kicked off. They posted every new guest keg that they were getting and with each post I was getting more and more excited. Also since Three Floyds Dark Lord Day was an incredible event a few months ago I thought For The Love Of The Hops might be just as good. On Saturday afternoon I drove out to Warrenville with Maeve Price in the front seat, and Ken Hunnemeder and Charlie Drews riding in the back. The Two Brothers brewery isn’t too far from Chicago and its right off the expressway, so it makes for an easy trip. The parking at the brewery wasn’t as bad as Three Floyds but we did end up having to park about two blocks away. When we first walked in we had our IDs checked and were given wrist bands. Then we had to wait in the line to buy tickets for the beer and food. This was one of the slowest lines we had to wait in all day. 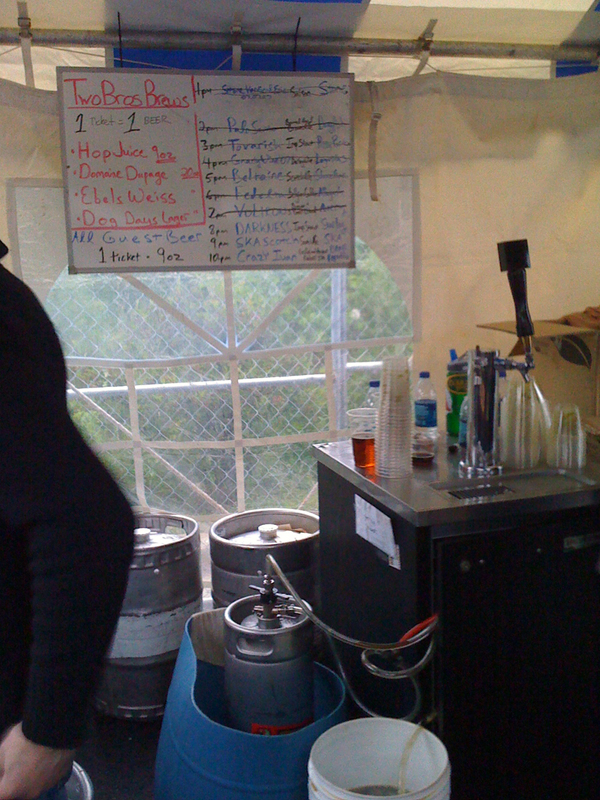 The tickets seemed like a good idea, it keeps the people pouring the beer from having to deal with cash and should speed up the pouring lines. Each ticket cost $6 and got you one beer. Some of those beers came in 9 oz glasses and some came in 20 oz glasses. Overall $6 for a beer felt a bit expensive, especially when all of the beers I wanted to try came in a 9 oz glass. On any other day you visit the Two Brothers Brew Pub, most of the beers are only $4 and the other ones like the Northwind are $5. 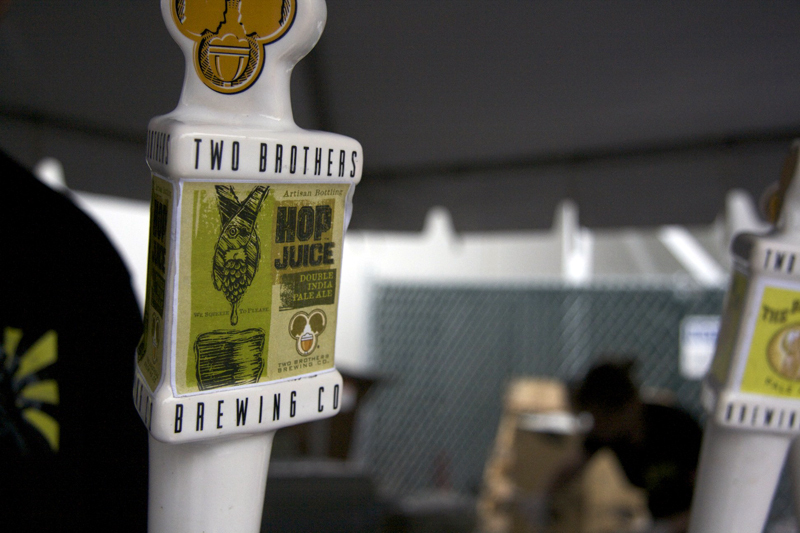 Charging two extra dollars for a beer brewed on site is ridiculous, if anything all the Two Brothers beers besides the Hop Juice should of been on special for like $3 for the event, not marked up in price. 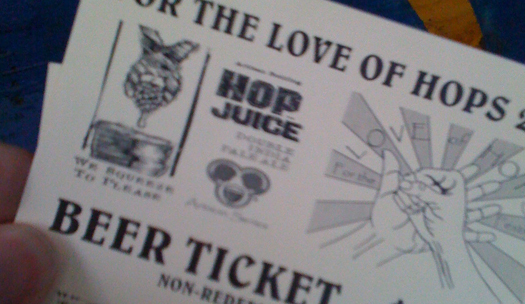 So we got our tickets and then went to get a glass of beer, the four of us ended up getting a Hop Juice right away since that was what this festival was for. The Hop Juice was good and a damn fine DIPA. It is smooth and thick at the same time with a the booze burn bringing up the rear. Being 10 % ABV this guy packs a huge punch. The four of us ended up finding a table inside and basically planted ourself there. About 45 minutes after we showed up and one Hop Juice into the festival Stephen, Selina, and Brad Stark showed up and joined us at the table. 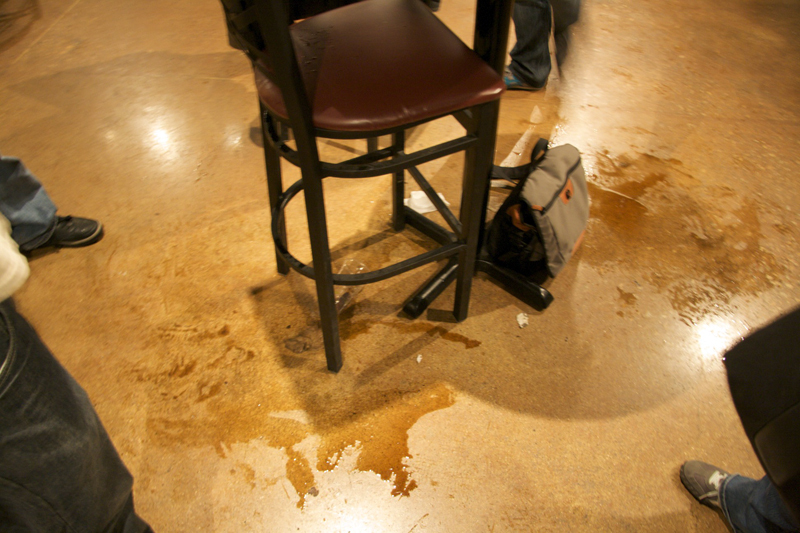 From then on every 45 minutes a few of us would go wait in the guest tap line for the next beer to be released and then bring 9 oz glasses back. 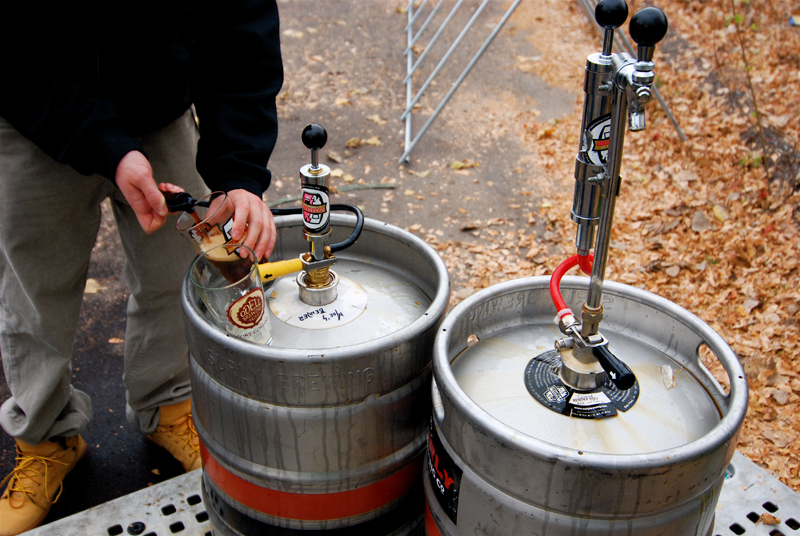 Just about every guest beer would run out 10 minutes after the keg was tapped. 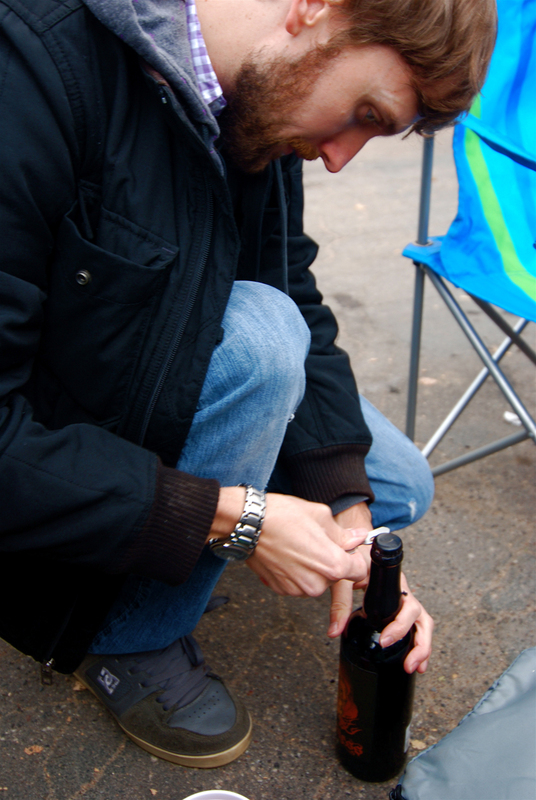 So we made sure to get there extra early especially for the Avery Voltron and Surly Darkness. To be honest I’m not a sour beer fan so the greatness of the Voltron was lost on me. But Ken, Stephen and Brad Stark loved it and declared it best in show. My personal two favorites were the Surly Darkness, and the almond cream soda from Two Brothers. I know, a cream soda. But is was really good and both Maeve and Selina agreed it rocked. We ended up leaving just after the Surly Darkness was tapped since the last couple guest beers didn’t interest us as much as the Avery Voltron and the Surly Darkness. 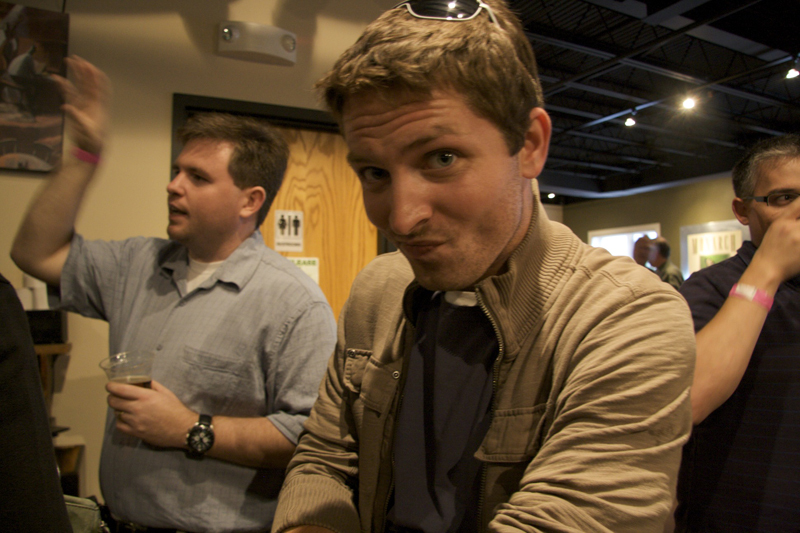 For this being the Hop Juice release party I was kind of shocked I only had one 9 oz glass of Hop Juice. Unfortunately Ken and I didn’t get any video at the For The Love Of The Hops festival, so you will just have to enjoy the photos. 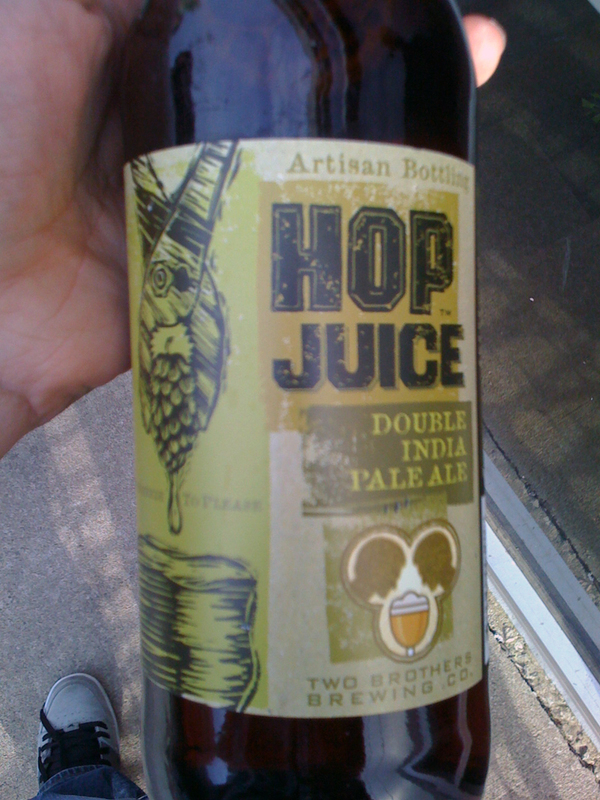 Maybe we will review a bottle of the 2009 Hop Juice on an upcoming episode. 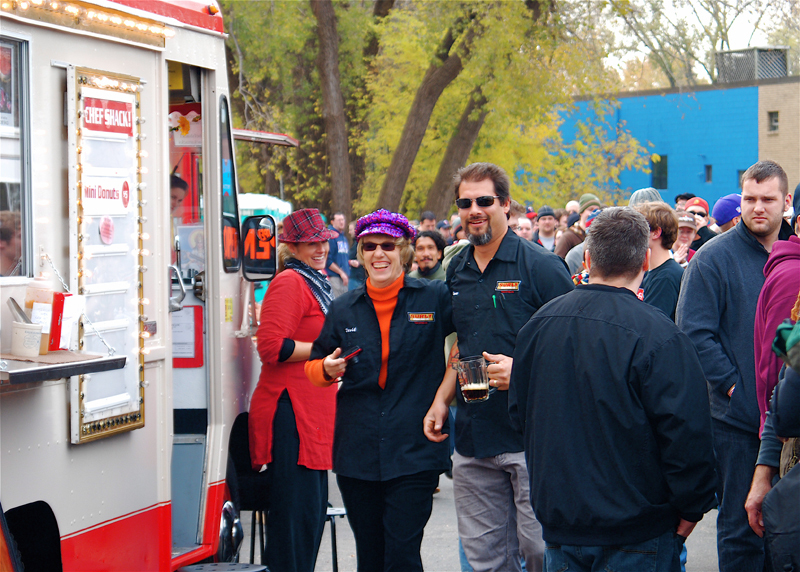 Overall the festival was fun, good beer – even if it was a tad expensive, tasty food, live music and not too crowded. If Two Brothers has the event next year I might check it out but I won’t be expecting as much next time. Finally, if you’re in the area be sure to check out the brewery they have tours every saturday at 1:00 and 2:30.